Hastings Direct, a trading name of Hastings Insurance Services Limited, is a UK company providing personal lines and related products online and by phone. Launched in 1997 we began life as a UK broker providing private car insurance policies and related products. We have since extended the product range to include much more — including home, bike and van insurance and a wide range of additional products and services. 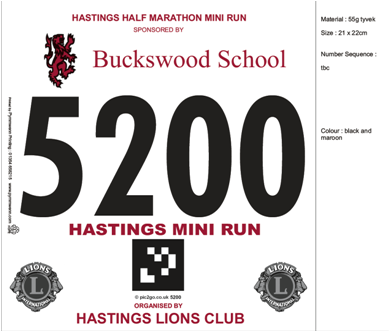 In line with its commitment to community initiatives and the promotion of charitable and health-based projects, Buckswood School is proud to announce its sponsorship of the Hastings Mini-run 2019, the single biggest sporting event locally. As part of our commitment to fostering the health and well being of young people, we encourage our scholars not only to participate in the many sporting opportunities available at school but to continue to pursue sporting activities beyond the school Gates. Our School Motto - Ad Vitam Paramus - translates as: 'we are preparing for life" and there is no greater endorsement of that sentiment than to encourage young people to include physical health initiatives as part of that preparation and afford physical health a life-long commitment. Buckswood would like to wish all competitors the best of luck, and while it is recognised that there will be a plethora of personal reasons for competing, it should also serve as a day on which to have fun, make new friendships and renew a life-long commitment to physical fitness and the support of community and charitable events. Official Shoe and Sport Sponsor Hastings Half Marathon 2019. At Intersport Wisdens we are proud to be associated with this great race. Following our recent refurbishment we have much more space for our wide and varied range of running footwear, apparel & accessories. We stock all of the major brands and our fully trained staff are always available for advice. This is another exciting landmark in our 120 year association with sports in Hastings and the surrounding area. Kings Stationers have been a part of the local business community for well over 100 years. From our retail shop in Park Avenue, Hastings, we offer an extensive range of general stationery supplies including paper, pens, inkjet cartridges and filing accessories. Our commercial stationery division provides an even larger range of products to local businesses. In fact, we have over 22,000 products available, usually on a next working day basis. And last but not least, we offer a wholesale bag supply service - paper bags, plastic bags, carrier bags and bar-grip bags in a wide range of sizes. The Clouds act like tiny stability balls, responding to every movement of your foot. They activate your postural muscles and enable you to stabilize your foot strike without artificial support, you are back in control.